The Meditation Garden at Graceland, Elvis Presley’s grave site, is perhaps the most emotionally moving area on the grounds of the Estate. It was designed and built by Memphian Bernard Grenadier (who also built the waterfall in the Jungle Room) in the mid 1960’s. One of the most beautiful and mysterious features of the Garden are the four nineteenth-century stained glass windows in the curved brick wall overlooking the graves. Moorish in nature and religious in their imagery, their meaning has been the source of much speculation over the years. In researching the history, it turns out that Mr. Grenadier obtained eight windows in Spain in the early 1960’s, each a different scene. He put four pieces in the Meditation Garden and, without any fanfare, put the other four pieces in his private home he built in 1965. 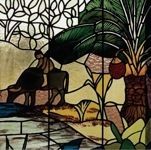 The four pieces in the Grenadier home, the companion pieces to the stained glass at Graceland, remained in that house in obscurity through four decades and several different owners. In July, 2001, a small property restoration company bought a large run-down house at 1809 Bryn Mawr in the Memphis area suburb of Germantown, Tennessee. It turned out to be the house that the late Bernard Grenadier had built in 1965. The nearly 5000 square-foot home was in a very bad state of disrepair. When the restoration company purchased the house in 2001, they had never heard of Mr.Grenadier and had no idea that there was any Elvis connection. They knew the stained glass in the old house was unique and beautiful, but had no clue as to just how special it would turn out to be. Two or three months into the restoration, a gentleman came by the house while the work was in progress. The man had grown up down the street and knew the house and the Grenadier family well. He told the owner of the restoration company a lot about the house (it had many unusual features), but nothing about the Elvis connection. He then asked if the company would sell him the stained glass for $1,000. When the owner of the company politely declined, the man said “You were right not to sell it to me. It’s worth a fortune.” He then proceeded to tell the owner what the glass actually was, the companion pieces to the stained glass at the Meditation Garden at Graceland. Upon beginning the process of verifying the accuracy of the story, the stained glass was removed from the former Grenadier house and securely stored. We now offer the four stained glass windows for purchase. We do not know. Nor does anyone else. The reality is that their value is what a serious buyer desires to offer. We will appreciate your contacting us if you have interest.